It is a new month, so the perfect day for a new blog post. Today started off on such a good note. My plum tree has its first blossom. I love these soft pink blossoms. They do not last long so I want to enjoy each one. I also have a son for the day. It seems a programmer at Sony thought this was a leap year and programed it into the PlayStation 3. This is such a major glitch it knocked out on-line gaming for a majority of gammers. Alex is off today from work, he works weekends, and it is fun to actually have a conversation with him. Lately, I have been thinking I spend way too much time on the internet. It is nice to look at everyone’s projects and get ideas, but I have way too many ideas. I need to find the time to pursue some of them. I do not think the internet will shut down for a day, so I must force myself limit the time I spend on-line. I have started doing all the mastery class projects for both my sewing machine and digitizing software. Hopefully it will be time well spent. I am not using these tools in the most advantageous manner. I forget things like using pattern repeat. Which would help me by not having to watch the monitor or count stitches when I want to stop on a specific stitch. I finished piecing the chop-suey top. 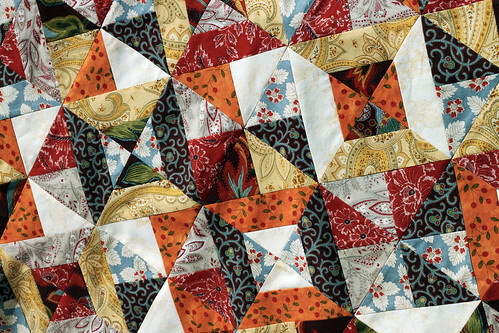 I am not sure exactly how I want to quilt it, so it is now on the back burner along with many other projects. It did take me more than 8 hours to cut and piece. The trick to sewing the 8 points together is pressing the seams open. Next time I will sew the squares together that way the first time. That should speed things up. This entry was posted on Monday, March 1st, 2010 at 12:28 pm and is filed under Garden and Quilt. Tagged: Garden, Quilt. You can feed this entry. You can leave a response, or trackback from your own site. Nice to see a sign of spring, even if it is so far away. True, there is sooo much to learn, I wish I had another lifetime after retirement. I like the quilt, even if it gave you some grief–it’s lovely. I love seeing that blossom! I’m glad you’re having a taste of spring! 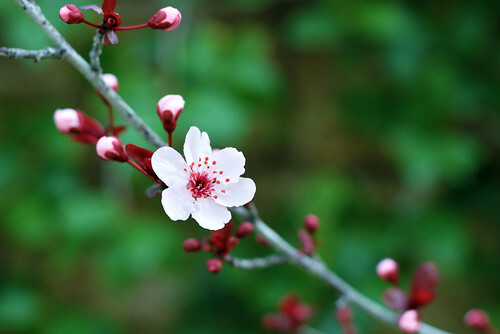 That plum blossom is gorgeous! It will be a few weeks before I even see a crocus! The quilt is gorgeous! Someday I will learn to do more than hem with my machine! I love the colors in your quilt!